A recent report published by Infinium Global Research on hydrophilic coating market provides in-depth analysis of segments and sub-segments in the global as well as regional hydrophilic coating market. 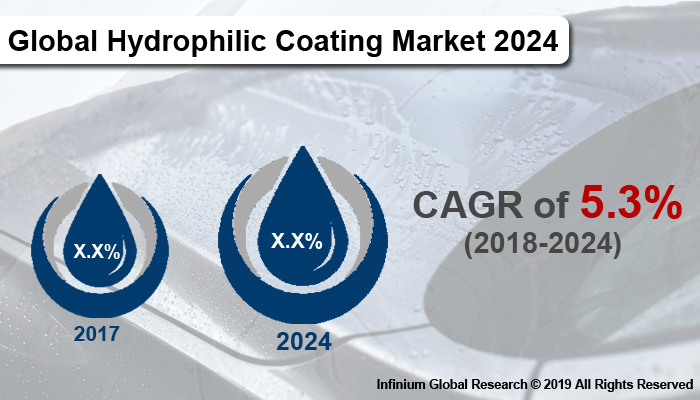 The study also highlights the impact of drivers, restraints, and macro indicators on the global and regional hydrophilic coating market over the short term as well as long term. The report is a comprehensive presentation of trends, forecast and dollar values of global hydrophilic coating market. According to the report, the global hydrophilic coating market is projected to grow at a CAGR of 5.3% over the forecast period of 2018-2024. Hydrophilic coatings are used to reduce surface friction and improve lubricity. These coatings absorb water and comprise more than 90% water when wet. They find applications in medical, automotive, electronics and several other end-use industries. These coatings are used on bathroom mirrors, eyeglasses, optical lenses, covers for headlights, outdoor floor lights, automotive mirrors, instruments in humid environments and other vehicle windows and several others. The increasing application of hydrophilic coatings in the medical sector is driving the growth of the market. The major factor contributing to the growth of the hydrophilic coating market is its increasing application to coat instruments such as catheters, cannulas, guidewires, and short-term implanted devices. In addition, the growing demand for less invasive medical procedures is increasing the application of hydrophilic coatings. They are used for coating medical equipment and needles as it greatly reduces friction between the equipment and the patient’s skin. Thus, lowering the pain and unnecessary discomfort. Furthermore, the rising applications of these coatings on automotive mirrors and in several electronic applications owing to the several benefits offered by the hydrophilic coatings promote the growth of this market. These coatings are durable, antifogging, easier to clean and accumulates less dirt. However, the high cost of hydrophilic coatings hampers the growth of the market. Moreover, rising applications of hydrophilic coatings for several biomedical types of research creates fruitful opportunities for market growth. Geographically, North America is the dominant region in the global hydrophilic coatings market. The increasing use of hydrophilic coatings for medical applications drives the growth of the North America hydrophilic coatings market. The rising geriatric population, high-income levels and increasing demand for less invasive medical procedures favor the growth of the North America hydrophilic coating market over the forecast period. Asia Pacific region is anticipated to grow at the highest rate over the forecast period owing to the growing applications of the hydrophilic coating across end-use industries such as automotive and electronics. In addition, the rising automotive sales contribute in this region contributes to the growth of the Asia Pacific hydrophilic coatings market. The report on global hydrophilic coating market covers segments such as a substrate and application. On the basis of the substrate, the sub-markets include glass, metal, polymers, and nanoparticles. On the basis of application, the sub-markets include optical, medical devices & equipment, marine, automotive, aerospace, and others. The report provides profiles of the companies in the market such as Aculon, Inc., Advansource Biomaterials Corporation, Applied Medical Coatings, LLC, Coatings2go, Formacoat, LLC, Harland Medical Systems Inc., Hydromer, Royal DSM, Sono-Tek Corporation, and Surface Solutions Group, LLC. The report provides deep insights into the demand forecasts, market trends, and micro and macro indicators. In addition, this report provides insights into the factors that are driving and restraining the growth in this market. Moreover, The IGR-Growth Matrix analysis given in the report brings an insight into the investment areas that existing or new market players can consider. The report provides insights into the market using analytical tools such as Porter's five forces analysis and DRO analysis of hydrophilic coating market. Moreover, the study highlights current market trends and provides forecast from 2018-2024. We also have highlighted future trends in the market that will affect the demand during the forecast period. Moreover, the competitive analysis given in each regional market brings an insight into the market share of the leading players. 8.2.6. Harland Medical Systems Inc. The detailed TOC contains information about list of tables & list of figures and the sub-segments of the study.